Update*** The Best Year Ever Promotion has ended, but we will be promoting Life Architecture soon! Please make sure to sign up for our ‘Five Habits’ resource on our homepage, and we’ll keep you up to date! You can buy now by clicking here. 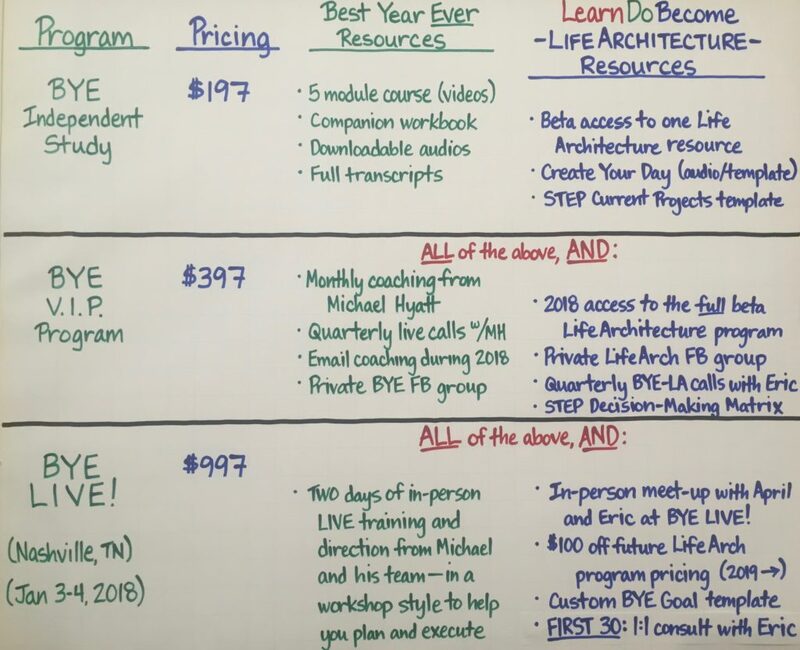 Michael Hyatt’s Best Year Ever program is open. It’s awesome. We’ve done it for three years now (which is why we’re now affiliates), and it’s well worth the price. Plus, Michael is teaching a powerful webinar you’ll want to catch sometime in the next week—even if you’re not planning to buy the program. It will help you prepare for an amazing 2018. You can register for a live webinar here. We’re also beta-launching our Life Architecture program in 2018—but only to those who join the VIP or LIVE version of Best Year Ever. You’ll essentially be getting TWO programs and exclusive support for a full year—for the price of one. It’s a special LearnDoBecome BONUS package, so anyone who joins ANY level of Best Year Ever can participate, and the doors are now open! Ideally, we would all be able to meet in Nashville January 2nd-4th, when Best Year Ever LIVE takes place. Eric and I will be there, and we can’t WAIT to meet up with as many of you who will be there, as well. But if you can’t travel to Nashville on such short notice (which we get!) the VIP package is the best value—not only because of what you’ll get from Michael Hyatt—totally worth the price on its own—but because you’ll also get Life Architecture resources and have the chance to be part of the fun at LearnDoBecome in 2018. Here’s the link to join now if you’re ready! We also encourage you to register for a webinar (Michael is holding several! ), take some time to think about the offer outlined above, and consider which level you would be interested in joining. If you haven’t yet, you might also like to take The LifeScore Assessment (which may close soon). We’re grateful for you, and we sincerely want 2018 to be the best yet. As one more fun resource, here are 8 Case Studies of Best Year Ever Alumni. LearnDoBecome is about progress—not perfection—and we appreciate the chance to be on this journey together. Here is the link to learn more about Best Year Ever! P.S. We’re still going strong in the FREE Life Architecture–Best Year Ever Facebook Group and invite you to post/share inside! I signed up and paid for your program over a year ago and life got in our way. I would like to access and my daughter also. I have emailed you your login, Nancy! Welcome back!